Hypokalemia (low serum potassium) can cause flattened T waves and prominent U waves. There may also be ST depression (but this is not sensitive). 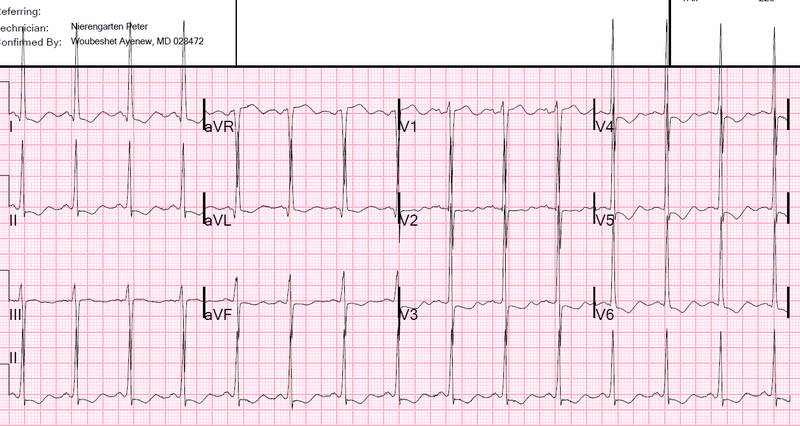 Chest pain and Diffuse ST depression, with STE in aVR. You probably think it is left main….. This ECG is from a woman in her 70s who presented with very atypical chest pain lasting days that was worse with movement and palpation. This ECG shows diffuse ST depression likely due to hypokalemia as it normalised after replacement. Pre-existing Left Bundle Branch Block and Atrial Fib: what is alarming on this routine pre-procedure ECG? This ECG is from an elderly patient who had a routine pre-procedure ECG. This ECG shows atrial fibrillation with LBBB (old) and large U waves. The cause was hypokalemia. This ECG is from a young man who presented with weakness and back pain on a background of an eating disorder and chronic kidney disease. This ECG is from a patient of unknown age who presented with generalised weakness and malaise. This ECG is from a patient of unknown age who presented after an insulin overdose. This ECG is from an alcoholic who presented with confusion.